Location, Location, Location Set on the doorstep of Plymouth Hoe, this Victorian townhouse had a wealth of character throughout and has no onward chain. Complete with fabulous views over the park, four en-suites and a self-contained two double bedroom apartment underneath. This unique property is offered to the market with no onward chain. SUMMARY Location, Location, Location – Set on the doorstep of Plymouth Hoe, this Victorian townhouse had a wealth of character throughout and has no onward chain. Complete with fabulous views over the park, four en-suites and a self-contained two double bedroom apartment underneath. This unique property is offered to the market with no onward chain. LOCATION Situated on the doorstep of the world famous Plymouth Hoe, Citadel Road gives easy access to the Historic Barbican and City Centre. Plymouth Hoe has staggering water views and public parks, perfect for anyone looking to enjoy the outdoors. This family home is located close to local and national restaurants, with local schools only a short commute away. Citadel Road is a short commute from the Royal William Yard, and has easy access to Cornwall via the A38 Devon Expressway and via the Torpoint Ferry. DESCRIPTION Entering the property via a period front door, you enter the porch then hallway. The hallway has an abundance of period features throughout, and gives access to the lounge, open plan, kitchen/diner, bedroom four and stairs to the first floor. The lounge has a bay window to the front elevation, views overlooking the park and towards Plymouth Hoe. There is a feature fireplace with large doors which would open into the dining room. This property has been modified so that the original dining room has been changed to bedroom four which also has an en-suite. Bedroom four has a bay window to the rear elevation, and the en-suite. The en-suite has a walk in shower, hand wash basin and low level w/c. The kitchen/diner has a galley style kitchen, with space for a dining table at the rear, with a patio door leading out onto a roof terrace. There is a range of wall and base mounted units, with a roll top work surface over and space for a range of white goods. 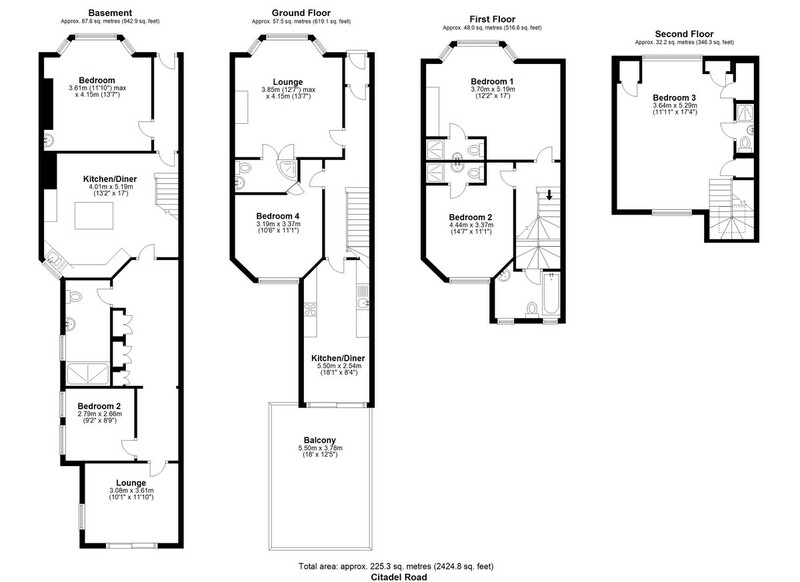 The first floor has a half landing, giving access to the family bathroom, the master bedroom and bedroom three. There is a flight of stairs leading up to bedroom four. The family bathroom has two windows to the rear elevation, plus a panelled bath with shower overhead, hand wash basin and plumbing for a washing machine. The master bedroom runs the full width of the property, has a feature fireplace and views overlooking the park and towards Plymouth Hoe. There is an en-suite, with a walk in shower, low level w/c and hand wash basin. Bedroom three has a bay window to the rear elevation and an en-suite. On the second floor, is bedroom four. Bedroom four offers dual aspect views across the city scape and overlooks the park and Plymouth Hoe. There is an en-suite and three separate storage cupboards. There is a door leading out onto a veranda to the front elevation. The self-contained apartment can be accessed by a flight of stairs from the main path leading to the front door. You enter the apartment via a wood frame door, which leads into the hallway. The hallway gives access to the master bedroom and into the open plan kitchen/diner. The master bedroom has a bay window to the front elevation and is a good size. The kitchen/diner is the hub of the apartment and gives has access to the rest of the apartment. There is a range of wall and base mounted units, with an island with a 5 ring gas hob. There is a feature fireplace and stairs leading up to the main house (which has been blocked off) with a range of cupboards underneath. The kitchen/diner leads through to a rear hallway, which has three large built in wardrobes, plus access to bedroom two, the main shower room and the lounge. Bedroom two has two windows to the side elevation and is well presented. The main shower room has large double walk in shower, low level w/c and a hand wash basin. It has a window to the side elevation, plus has a tiled floor to finish. Finally, the lounge has dual aspect views over the garden. There is a large patio door leading out into the rear gardens. OUTSIDE Externally, the property benefits from a level rear garden and is hard paved with a range of mature shrubs and trees. There is a decked area, a shed and access to a service lane via a gate. The roof terrace is accessed via the kitchen/diner and has a railed boarder, with stairs leading down to the garden. The veranda on the second floor is accessed via bedroom four, and is south facing.